New, from the developers of the Roads of Rome series! The Queen once again calls upon Don Diego de León to fulfill an important mission. He must organize an expedition to the new land and appoint its leader to expand the discovered territories and replenish the treasury with gold. Upon arrival, the expedition meets locals who tell them about evil priests that are trying to summon a demon to subdue all known territories. To help, the Spaniards need to find 4 skulls that can cast a protective spell. Master Miguel Sanchez is chosen for this serious mission. 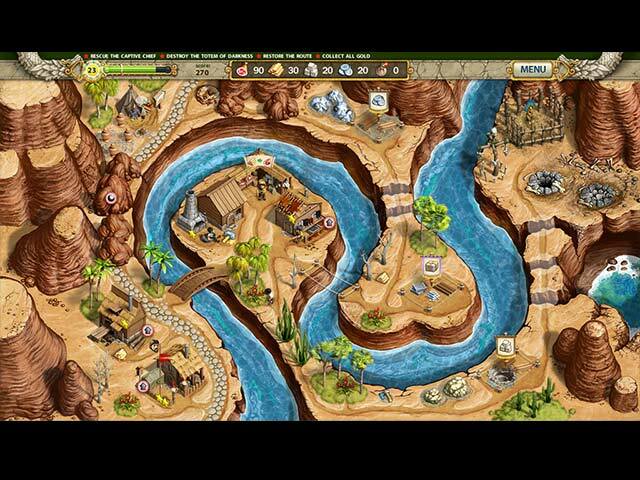 Play as Adelantado to help him explore new territories, collect gold, and protect the locals. 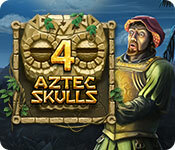 4 Aztec Skulls is rated 3.6 out of 5 by 69. Rated 5 out of 5 by MikaJackson from Just Love It Can't say enough good things about this game although I still have not finished it with all expert levels I can't stop trying. Great game, wish there were more that played the same as this one. Rated 5 out of 5 by godfreygirl from LOVE this game....but SO slow! I love to play this game. It's very challenging and interesting. There are lots of "turns and swerves" to it and hidden things to find. The ONLY thing I don't like about it is it the characters are SOOOO slow. You can construct a building to speed the workers up and one to work faster.....but only when the little shoes or hammer shows up by the buildings. I really hope the developers make a sequel BUT PLEASE give BONUSES to do that....not buildings. Plus, make them a bit faster in the first place. I LOVE the game and find it fun and challenging, but it's frustrating to wait so long before tasks. The scenery is very interesting and well crafted and the little guys are cute running around....but again, they do it SO slow. I recommend the game highly, but prepare to be patient. Rated 5 out of 5 by Bethe1s from Best Time Management Game in a While This game is so much fun. Reminiscent of old-school time management games with far better graphics. It is exactly like Roads of Rome where you will need to build, stock up, and use different strategies to beat each level. It also has modes from beginner (no timer) to experienced to difficult. Well worth the investment. I definitely recommend. Thank you BFG. Rated 5 out of 5 by shereeaubin from Gotta Love It!!! If you love Roads of Rome and Adelantado well here you go...Two in One. Enjoy and dont forget to look for the little treasures like in the last Roads of Rome!!! Rated 5 out of 5 by franzi501 from I love it! No, it's not like Adelantado, but a lot like Roads of Rome. But I don't mind at all since I love both of those games and bought all parts of them. I absolutely enjoyed playing 4 Aztec Skulls, I played the whole thing about 3 times already. As in Roads of Rome, graphics are great, there is strategy, collecting, challenge. More of this, please! I absolutely recommend it (unless you didn't like Roads of Rome, of course). Rated 5 out of 5 by calton from Fun and Challenging Loved the challenge of finding all the buried secrets. Great game. Rated 5 out of 5 by bjmoose59 from Awesome! Love this game, can't wait for version 2. Rated the story line low because this isn't a big issue for me. Love the rest of this game. Rated 5 out of 5 by judyj450 from loved it! this is just like my favorite "Roads to Rome", in fact developed by same! that was my first game that brought me to BigFish, and i never thought this would be just like it. so i am so happy i tried it! FANTASTIC! Bring more on!!!!! please??? The Queen once again calls upon Don Diego de Leon to fulfill an important mission in this time-management adventure.